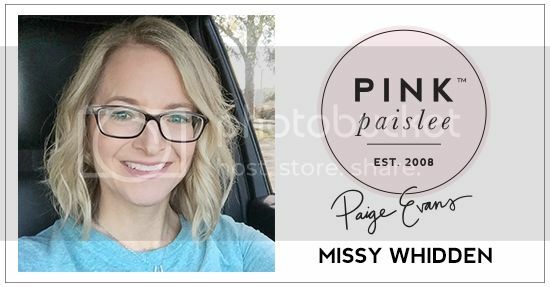 Missy Whidden is back today to share her second layout for my design team using mostly Fancy Free! She also made a process video which, if you're like me, you loooooove watching those! It's so inspiring to see how her mind works and exactly how she creates such intricate pages! Hello again, scrappy friends! 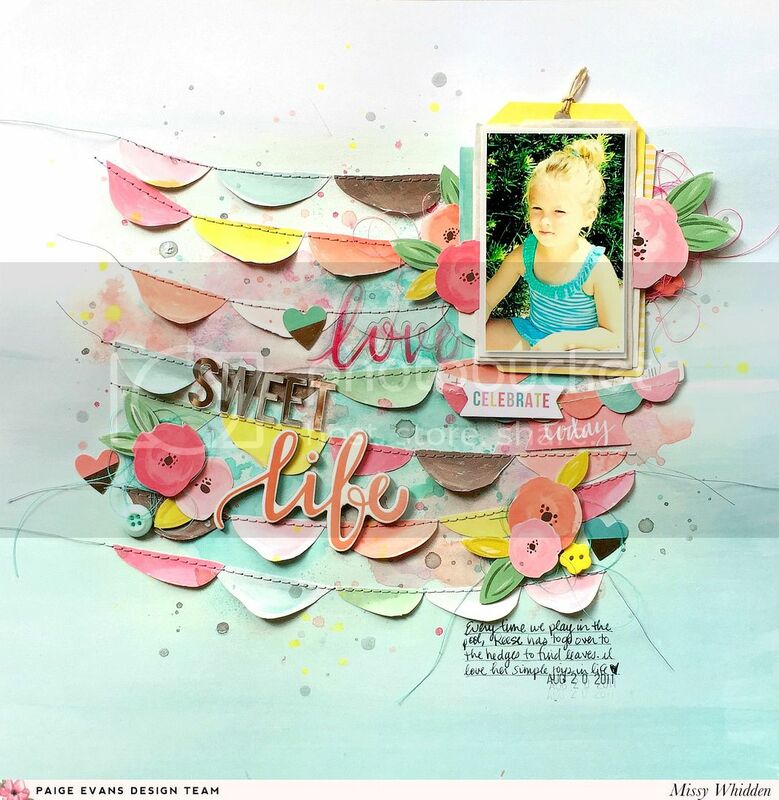 Missy back today to share a fun layout using the Fancy Free collection with a little bit of Take Me Away added in. I can’t get enough of bright colors and I love combining them all together. As I sorted through the Fancy Free patterned papers, Paper 09 jumped out at me. I knew I wanted to create some fun banners out of all those half circles, so I fussy cut a lot of them out. I arranged them several times before I found a design I liked and used the Paper 10 as my background. I went over the background with white gesso and then used some blue, aqua, pink, and coral ink sprays to create the pretty watercolor effect. Once I glued down all the half circles, I machine stitched through each row using dark gray thread. 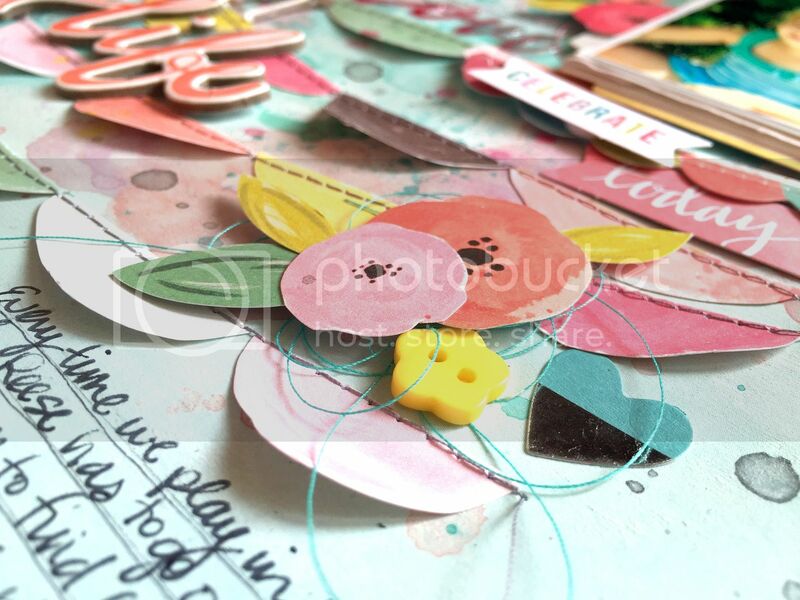 I embellished with some fussy cut flowers, dimensional stickers, chipboard, mirror letter stickers, and some buttons. I love the dimension of the half circles! After I stitched them down I ruffled up the edges so they would look more realistic. I fussy cut these beautiful flowers from one of the papers in the Fancy Free 6x6 Paper Pad and added some foam under them. I layered in some tangled thread, a button, and a cute heart die cut. You can also see the awesome dimension created from the chipboard. I added more fussy cut flowers here by the photo as well. Behind my photo I layered some tissue paper, a few tags from Fancy Free and a Take Me Away die cut frame. 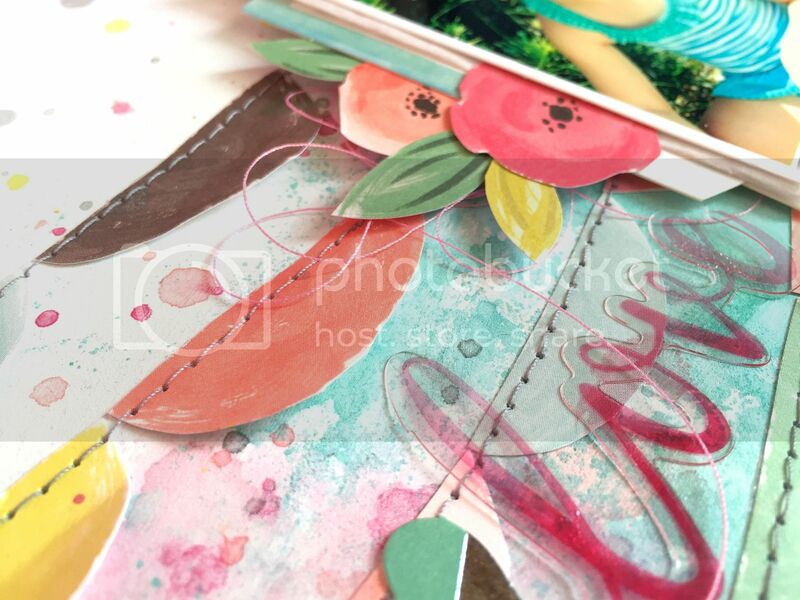 I love how the colors of the background look mixed with all these bright colors from the embellishments and paper. I added in an acetate die cut from Fancy Free here also. I went pretty simple with the background work up at the top since the rest of the page had so much going on. I had so much fun putting this together! I hope you gained some inspiration from it. Don’t be afraid to fussy cut your patterned papers and throw lots of colors together! Happy Friday and have a wonderful weekend! Doing anything scrappy?? So gorgeous! LOVING the stitched banners!!!!!!!!!!!! !